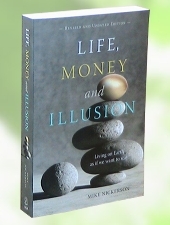 Appendix of "Life, Money and Illusion"
While “two heads are better than one” is time-honoured knowledge, there is a catch. Co-intelligence requires open, trusting communication. This is not always easy in a world flooded with audiovisual imagery of people taking offense, expressing indignation and getting even. We learn by example, and the television/video/DVD industry now produces a large proportion of what many individuals presently experience as human interaction. Under pressure, we draw rapidly on our mental store of experience, and pseudo-experience, to form the thoughts we express. One careless phrase can change an interaction from one of trust to one of suspicion. From suspicion it is not far to the frustration, anger and obstruction that can paralyze a group that might, otherwise, have worked very effectively together. Those who dare to look at the challenge of our times can be particularly prone to suspicion. While a solid faith in human potential might enable one to escape paralysis, fear is often not far from the surface. We are in extreme danger, and suspicion is a complement to the fight-or-flight response by which creatures have escaped danger since long before humans appeared. It is also the case that those of us who feel that the popular legitimacy must change, have taken a bold step. Having taken issue with the conventional legitimacy once, it is not as hard a second time to challenge the emerging wisdom of our own organizations. Times of change are voltile. At a conference I attended in 2005, the organizers had every participant draw a slip of paper from a hat. We were told that, according to the note we had each drawn, we were to play the role of either an ally or a spy. We were then divided into groups and given a slightly contentious topic related to the conference theme. We were asked to seek consensus on the topic. If, during the discussion, anyone suspected another participant of being a spy, a vote was initiated. If the majority in that group believed the person to be guilty, he or she was barred from speaking. Following the game, we were asked how we felt. Some of the people who had made the accusations were embarrassed to find that they had jumped to a false conclusion, based only on the suspicion that there were spies among them. Those fearing accusation and rejection found the exercise intimidating. Afraid they would be taken for “spies,” they had censured themselves from expressing dissenting views. Some of these mentioned feelings of shame at not having had the courage to speak up. Many of those deemed as “spies,” even though they were “allies,” expressed feelings of betrayal and rejection. Because distrust had run rampant in both directions, many good ideas were lost to the discussion. As a result of the exercise, participants better understood that differing opinions do not necessarily mean people should be distrusted. What follows is a procedure that a group can adopt to tap into its greatest potential for its work together. “Consultation” is a recipe for co-intelligent meetings. Assembling in a circle gives form to the assertion that everyone is equal. In a circle, each person can hear everyone else directly and be heard clearly in return. whatever issues you are going to discuss. Identifying the topics to be discussed in advance enables some premeditation that will help prepare participants for the occasion. Before getting down to business, it helps to take a few moments to focus attention on the spirit of the gathering, the whole that is greater than all the individuals present. Sometimes joining hands to connect the circle for a few moments of silence is helpful. The mood of the meeting can be further guided by expressing together the wish, silently or verbally, for guidance and inspiration. While focusing on the synergetic potential of the group, or whatever sense of a higher power participants hold, ask for help to make the best possible decisions for the effectiveness of the group, for the well-being of the next seven generations and for all life on Earth. So met, the gathering is ready to proceed. The four techniques below can guide discussion to more productive ends. 1 - When an idea leaves a person’s lips, it no longer belongs to the individual but becomes the possession of the circle. relationship to the idea’s content. that encourages adherence to the second rule. 2 - Express everything that comes to heart or mind on the topic being discussed, even if it goes against what you feel yourself or the mood of the meeting. should be made to include the research findings for consideration as well. 3 - When conflicting views do arise, they are not to be avoided. have identified an appropriate course of action, dissenters are asked to go along with the plan. The purpose of this is to avoid confusion about the decision when it is being implemented. If there is not total cooperation in implementing a decision, and the action fails, it will not be clear whether the failure resulted from a wrong decision or from the lack of cooperation. The distinction is important for guiding future actions. Since all perspectives are to be given fair consideration at the time of the meeting, any shortcoming arising as the plan unfolds will be viewed in the light of the divergent views. If everyone is trying to make the plan work and it doesn’t, it will be clear that something is wrong with the decision, and it can be reconsidered at another meeting. Attitude can make all the difference. If cultivated, the following attitudes can help the process become increasingly effective. Courtesy: Listening with interest to all ideas expressed and speaking the content of one’s own mind fully and with clarity. Aspiration: Allowing and encouraging our better selves to dominate our weaknesses. Detachement: Allowing equal respect for all views whether they come from our own lips or from someone else’s. Humility: Removing the obstacle of one’s own importance and thereby enabling serious consideration of what others say. Patience: Hearing all that is being said before forming judgments. Service: Accepting the responsibility of looking for the truth by expressing all that comes to mind related to the topic and in turn listening to all opinions put forward. Consideration: Topics of sustainability require that consideration go beyond the interests of the people present. Success requires including the interests of other people, both those alive today and those who will be living in the future. In addition, the interests of the other living things with whom we share the Earth and the Earth as a whole need to be held respectfully in mind. When the topic at hand has been fully discussed, the group can then make its decision about what actions to take. Who will do what; what effects are expected from the action; and how will the effects observed be compared to those anticipated? Finally, the information gathered, following an action stage, can provide feedback for subsequent meetings, enabling the group to move forward towards its goals.